A trust set up in the wake of the closure of Scotland's National Museum of Costume says it has completed its business case for redevelopment. 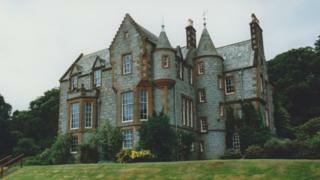 Shambellie House near New Abbey was shut five years ago as past of a cost-cutting exercise. The trust took over in 2015 in an attempt to save the building and ensure it had a future. It has now drawn up £6m plans to run classes, workshops and residential courses at the site. Chairman Gordon Mann said: "The trustees have formed a very clear vision that has come out of all these discussions and the work that we have done. "That is to create a centre for day and short residential courses but those courses need to be rooted in the environment and culture of Dumfries and Galloway. "So it is about explaining and getting people to enjoy what is good about Dumfries and Galloway." He said that could include courses on arts and crafts, photography and wildlife. Mr Mann said the turning point for their plans was when they started talking to local people who wanted to deliver the courses. "We held six workshops, they were the most energising events I have ever been to," he said. "We now have 35 tutors who are all ready to start delivering courses and that has given us a tremendous lift and means the business plan is underpinned by some solid, high quality information."